Another Long Walk: Post 12: Field Trips! Kościuszko Mound was constructed in the 1800s in commemoration of the Polish national leader, Tadeusz Kościuszko. Kraków has four of these memorial mounds--two prehistoric and two modern ones. (This is one of the modern ones.) Interestingly, you'll find information about the American Revolution in the nearby museum devoted to Kościuszko in which he fought. There's an urn buried here with soil from Polish and American battlefields where he fought. On an unrelated note, the two people in the photo are one of the teachers and a student of the school I attended. They regularly had after school activities and today's walk was to the Kościuszko Mound--which was a place I wanted to visit anyhow and thought it great that I now had company for the trip! View from the top of the mound. It's extensive! 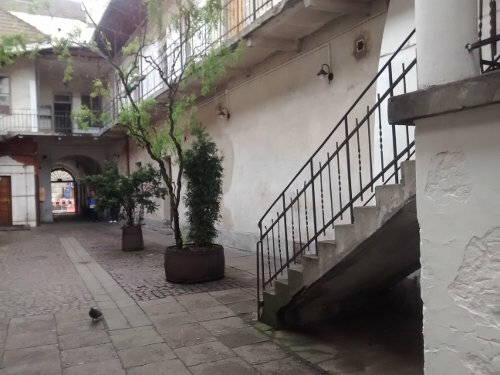 This staircase in the Jewish section of Kraków, I was told, is where they filmed a scene for Schindler's List when a girl in a red coat hides under a staircase from some soldiers or something. Never having seen the movie, I had no idea what the guide was talking about, but I took a photo for Amanda since she's a movie buff and loves that kind of stuff. I have no idea if the setting is at all recognizable from the movie! Kupa, in Polish, means "poop." 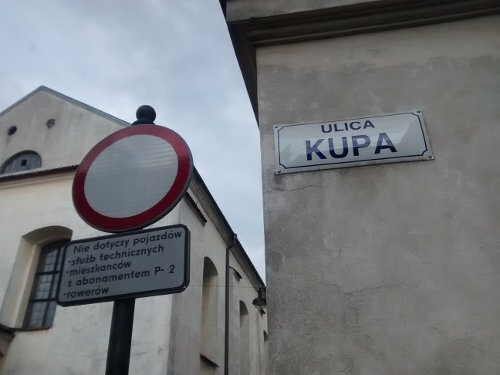 (Ulica means "street".) So I am standing on Poop Street. =) Apparently, it's a popular place for Polish people to take silly photos, but this is in the Jewish section of Kraków and apparently it has a Hebrew or Jewish meaning something else entirely. (Don't ask me--I have no idea.) So it's not really supposed to have a negative connotation, but it does for Polish-speaking people! Zakopane is a popular tourist trap practically on the Slovakian border deep in the Tatras Mountains. I'm told the area is absolutely spectacular and has some of the best views of anywhere in Poland, but the weather was pretty miserable while I was there and I never saw any views. The town was adorable, though, famous for wood carvings, a local mountain cheese called oscypek, and people walking around with a shephard's axe called a cuipaga. There's nobody in this picture to really give it scale, but this sign is HUGE! By comparison, see that smaller wooden carving on the far left? This church is made almost entirely from wood. It's quite interesting! Next town I want to make a quick mention of: Katawice. It's a sizeable town of about 300,000 people and this is the Cathedral of Christ the King--Polands largest cathedral according to my guidebook with a base measuring 89 by 53 meters. But I gotta say, it's kind of boring as far as cathedrals go. It's like they used their budget just to make it big rather than beautiful. Even the inside is large and stately.... but surprisingly plain and kind of boring. Still in Katowice--my guidebook says this 14-story, 60m-tall building was the tallest building in Poland from 1934 until 1955 and is--to quote my guidebook--"the best example of functionalism in Poland." Well, at least it's functional, I suppose. But it amazes me that a building that would be the tallest building in Poland for over 20 years would be designed to look so.... blah.